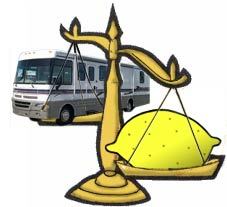 Is Your Motorhome or RV a Lemon? Get 100% FREE Lemon Law Help! If you are spending more time waiting for repairs when you should be "roughing it smoothly" the way you planned, we want to help! You can contact us by email or call toll free at 1-800-LEMON LAW (1-800-536-6652) to discuss with our staff the possibility of taking your case and pursuing the appropriate claims for a refund, a new motorhome, repairs, extended warranty coverage or some other remedy. Either way... IT'S FREE!!!!! Whatever way you participate, we can help you gain the satisfaction you deserve. This site is designed to provide information about Motorhome problems. Have a problem that you don't see listed here? Contact us by using the form below. If you have experienced any of the above problems, state and Federal consumer lemon laws and/or warranty laws provide powerful rights to consumers, ranging from a refund, a new motorhome or RV, or some other remedy. Why settle for excuses and aggravation anymore? If you would like to know whether or not a legitimate claim for recovery under the lemon law is available to you, take a moment to fill out our contact form below. There is no cost or fee for doing so and if we can help you, we will contact you shortly.